An intensive, hard-fought campaign ended at midnight yesterday. After a two-day moratorium, the four major parties go before the court of the sovereign people on Saturday for their verdict on who should control 341 local councils in all parts of the country. We congratulate the Elections Commission for taking effective steps to ensure a free and fair election campaign with all parties and independent groups observing or being forced to observe rules and regulations because the Commission warned that any party or candidate violating election laws would face severe penalties. As a result most observers believe the elections campaign was one of the most peaceful in recent decades though a few incidents were reported and the police took swift action on the orders of the Elections Commission. A special word of thanks to Elections Commission Chairman Mahinda Deshapriya, who not only spoke out strongly but also acted effectively to ensure that election laws were adhered to. Mr, Deshapriya went as far as objecting to a special parliamentary session being held today to debate the reports of the Commission which investigated the alleged bond scams in the Central Bank from February 2015 to March 2016 and the commission which probed serious frauds and corruption mainly during the former Rajapaksa regime. The Chairman even warned he might postpone the long-awaited and long-delayed election if Parliament broke the moratorium rule and held a debate on an apparently election-related issue on February 8. Eventually, Speaker Karu Jayasuriya, Prime Minister Ranil Wickremesinghe and other party leaders agreed to hold the debate on Tuesday and continue it on February 21 and 22. Another important feature is that Saturday’s polls will be a test of the new mixed electoral system where 60 per cent of the candidates will be elected on the first-pass-the-post basis while 40 per cent will come in through the proportional representation system. The old system and specially the preferential or Manape process has come in for widespread criticism because it caused not only more violence but also promoted bribery and corruption because candidates had to obtain money by fair means or foul to campaign throughout a district. Another major feature is the 25 per cent representation for women, widely seen as an important step towards gender equality. After years of talks, which led to disputes and wrangling, the new mixed electoral system was finalised and gazetted a few months ago. For the first time counting will take place in thousands of polling booths instead of counting centres and the Commission has assured that adequate security will be provided. With some 15.6 million people eligible to vote, most analysts believe the turn out will play a key role in the results. The United National Party (UNP) led by Premier Wickremesinghe. The Sri Lanka Freedom Party (SLFP) led by President Maithripala Sirisena, the new Sri Lanka Podujana Peramuna (SLPP) led by former president Mahinda Rajapaksa and the Janatha Vimukthi Peramuna (JVP) led by Anura Kumara Dissanayake have all expressed confidence of winning a majority of the municipal, urban councils and Pradeshiya Sabhas. Many people are saying there are rogues involved in bribery or corruption in all parties and as a result they are sick of elections. They say they want to boycott the polls. But they need to be aware it is the first time that the countrywide local council elections are being held on a single day. 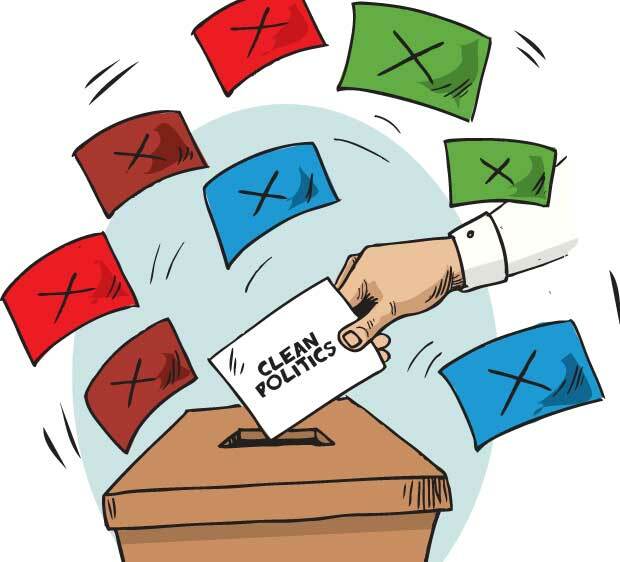 Besides that, not only local issues, a mission to ensure clean politics are also key issues in Saturday’s polls. Therefore, we urge responsible citizens to reflect deeply and cast their votes to candidates who will sincerely and sacrificially serve and give to the people. Caste your Vote wisely.......How do we do that?????????? Candidates think the Voters live on punnak.